Jared Farmer's review of The Book of Mormon Musical is one of those overly-analytical approaches that attempts to say more about a subject than the subject deserves, and so ends up being profound about the wrong things. What he does get right in the process often ends up being right but in the wrong context. Which is not to say that I don't appreciate the effort. To start with, Farmer is right that Trey Parker and Matt Stone treat the subject with kid gloves. The biggest reason is that they are mocking what they love, or at least like, which should be obvious from this classic Matt Stone quote: "I hate conservatives, but I really [expletive deleted] hate liberals." Mormons are the kind of white, middle-class conservatives that are safe to dislike without wasting the emotional effort it takes to actively hate something. Farmer correctly concludes that Mormons are the new "retro-cool" group that anybody can make fun of, and Mormons should be very thankful for that. But he goes off track when he complains that "Most egregiously, the play mischaracterizes Mormon theology," and then spends the bulk of his review telling us why in detail. Except that in a story like this, Parker and Stone only have to be in the ballpark. Getting the "look and feel" right matters a lot more. In the mission field, the emphasis is on sealing the deal, not wading through the fine print. In places like Japan, where sectarian distinctions pretty much end at distinguishing between Catholicism (that has historical roots there) and everything else, the fine print evaporates into a colorless, odorless mist. To be sure, Farmer's discussion of the nexus between Mormon theology and popular culture is more interesting than the rest of the review. I'd like to see him tackle the subject at length, quite apart from the The Book of Mormon Musical. But even there he tends to overreach. Unlike evangelical missionaries who want to save you from going to hell, LDS missionaries want to help you reach your potential in heaven. Mormon eschatology is radically egalitarian, and very American: everyone gets a second chance, everyone wins. It would make a great, cheesy musical number. Except even most Mormons wouldn't "get it," and those that did would likely be "offended" (meaning, not really, but as a sign of solidarity). Again, for the dramatic goals of this story, it doesn't matter. Getting the theology wrong in The Book of Mormon Musical is like getting the science wrong in Star Wars. I'm always amused by critics who care more about Mormon theology than Mormons do. Since such critics inevitably draw a blogospheric reaction from those Mormons who make a hobby of caring (and deeply), the combustible results may suggest that everybody cares, when the church only reluctantly does (in public). Mormons don't have to care unless they really want to (in their own free time). Mormonism is surprisingly free-thinking in this respect: you can subscribe to almost any theory about God and the universe you want to if you don't (openly) buck authority. The church cares more about your behavior than your beliefs. Which is why even conservative Christians are coming to the conclusion that Mormons are "mostly harmless." Because the goofy theology aside, they behave well. When they grow up, at least. 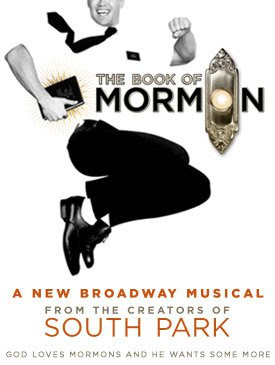 Here's the real "problem" with the musical: based on everything I've read, heard and seen, Parker and Stone depict Mormon missionaries as far more naive, idealistic, and well-intentioned than about ninety percent of the missionaries I have actually known (including me). They don't go light on the theology. They go light on the dumb shenanigans Mormon missionaries and their leaders are capable of, that make the vulgar kids of South Park look urbane by comparison. The last thing the church wants is somebody writing a popular play about what really goes on in Mormon missions. Which, again, makes The Book of Mormon Musical a godsend to the orthodox church. Look! Squirrels! As cynical as my own missionary memoir is, I wrote it soon after my mission and left out the really weird stuff, mostly because my still-TBM self couldn't process how psychedelically bizarre the experience truly was. But here's an account of the same thing happening halfway around the world a decade later. The first 15 minutes directly addresses the subject, and again starting at the 36 minute mark. Imagine if Parker and Stone wrote a musical about that!